I drove out to UCI on my lunch hour, and got my first view of the newly-completed Student Center. There are actually some parts of the building left over from the previous one, but the whole exterior is new. Then I remembered a photo I’d taken of the old Student Center, back when I was attending the school, from the top of what was then the Humanites Office Building, now Murray Krieger Hall. Since I had extra time on parking, I decided to see if I could match the shot. Both photos were taken from the walkway that runs around the top floor of Murray Krieger Hall, at the front left corner (looking at it from Ring Road). I matched the location as closely as I could by pulling up the web page on my phone—a good thing, since otherwise I would have forgotten to include the tree branches in the foreground. As it is, I still managed to get the framing a bit off. The oblong Administration building, with its arrow-slit windows, still rises in the background. 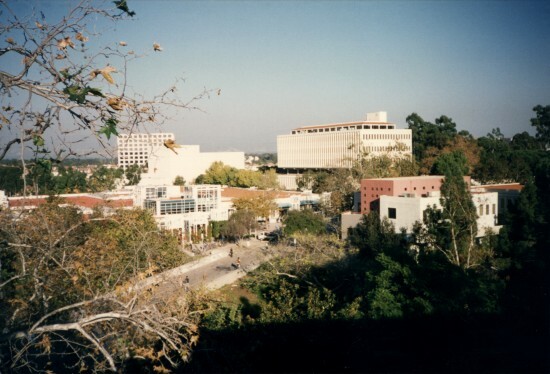 The top of the Irvine Barclay Theatre is still visible to its left, as is the top of an office building across the street, but both are nearly hidden by the new beige brick block that replaces the much smaller building that used to house the student center. Off to the right, Student Services II is still visible, but the trees have grown in front of it. Aside from digital quality, the circumstances are quite different. The late afternoon sun washes out the buildings in the background, and casts the trees below into shadow. And that day 10 years ago was considerably smoggier, not even a silhouette of the mountains visible. I don’t remember what time of year I took the older photo. I couldn’t find the negative, but I did find a copy of the print (which I’ve rescanned). It was on my website by July 1997, the oldest revision of the page to appear on archive.org. And I was inspired to take it by seeing a similar photo on another student’s website, which I saw while exploring the sites hosted on the School of the Arts webserver. I wouldn’t have been looking at those until spring 1996. As a guess, it was probably fall 1996 or spring 1997. Update: I’ve posted both photos on Flickr: here’s the 1990s view and the 2007 view. 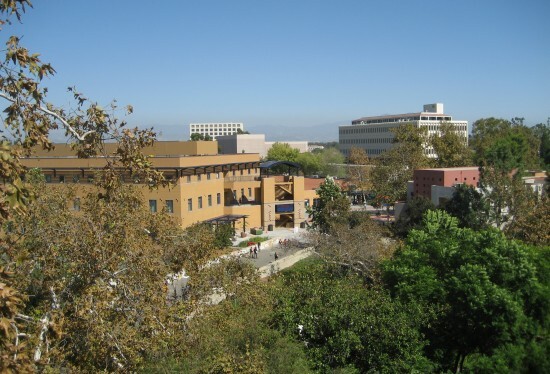 This entry was posted in Highlights, Photos and tagged Irvine, Long, scenic, UCI on October 4, 2007 by Kelson. I like that Admin no longer dominates the skyline, but this vantage point of the Student Center makes it look pretty much like the newer Humanities buildings. It looks like them from up close, too. One of the things I liked about the older building was that it didn’t look like anything else on campus. Nice before and after shots. Thanks! Nice before and after pictures. I saw your comment over at the OC Archives blog and followed it here. I briefly visited UCI as a returning Vietnam vet in 71. Needless to say, nothing is familiar from the photo. That’s understandable. I think most of the buildings in the first photo were built in the late 1980s. I thought the Administration building at upper-right might have been around in 1971, since it’s one of the original Pereira-designed buildings, but I did some searching and it looks like it wasn’t completed until 1974. As a guess, the only building in either picture that you might have seen was the one I was standing on!